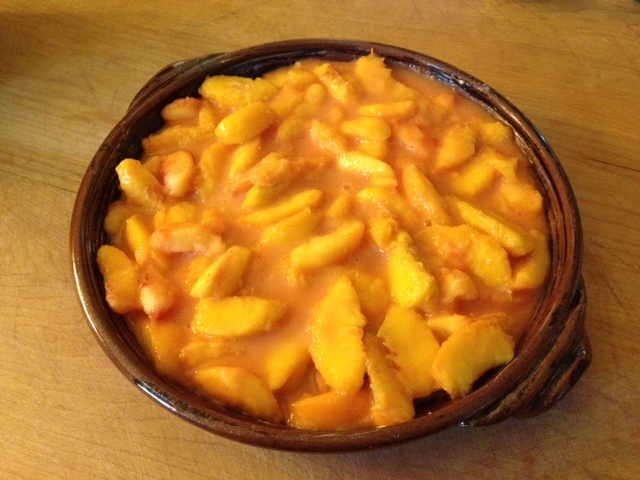 Hands down this is the best Peach…thing…I have ever had, and possibly one of the best desserts I have ever made. I need to decide on a name for this. Peach Crumble? Peach Cobbler? Peach Crumble Pie? Peach Pie? Hm. 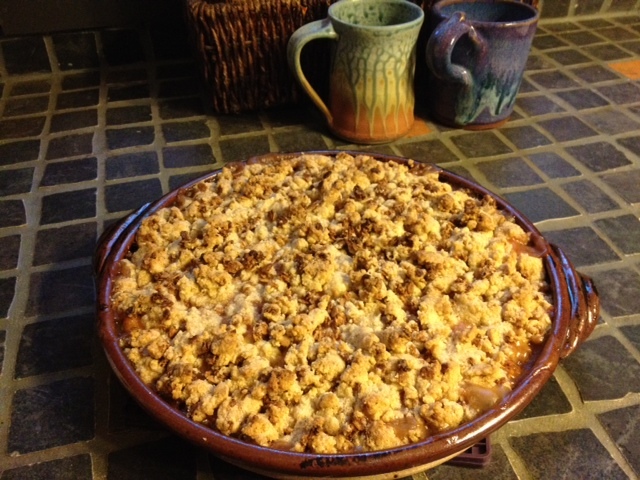 I’m going to go with (drum roll please) Peach Crumble Pie. Done! We had quite the harvest of peaches recently and no one was more surprised than me. We have had a number of problems with our peach trees to date: a gross leaf curl/fungus thing that I truly thought was going to kill them; little hard peaches that never seem to ripen; animals/birds eating them; and some kind of gross bug which makes them look like they have weeping sores (that last one is the grossest so far). I have considered ripping the trees out, which to people who know me is shocking, and I have gone on several rants about how stupid it was for the previous owners to even plant peach trees because Portland just is not the right climate. So I may have a little (tasty) egg on my face. Of course, it also may be the perfect storm of unusual circumstances that led to this year’s peach harvest. Things like a weirdly early and overly hot season and the trees also being in the sweet spot of their three year cycle for producing fruit. I may never see this again (and one of the three trees still has that weeping sore problem). So I felt like I needed to make the most of this harvest. Since peaches really don’t store well at all, and since I didn’t feel like cleaning my house Sunday morning was a very cool one, I decided I would finally try the recipe for making Ginger Peach Jam from my trusty and good old reliable canning book: Put Em Up! The recipe was ridiculously simple (Peaches, Bottled Lemon Juice, Sugar, Fresh Ginger, Pamona’s Universal Pectin & Calcium Water). And since I am starting to really get the hang of this canning thing it seemed almost too easy. The most time consuming part of it all was peeling the peaches. I ended up with 10 half-pint jars of jam. It is soooooo good. Mike was savoring it this morning on his [gf] toast. 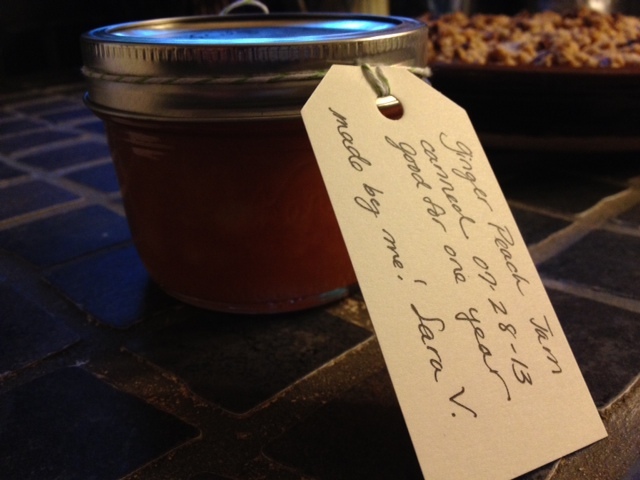 Here is a picture of one of the jars. I love this stubby little jar. Kinda cute. 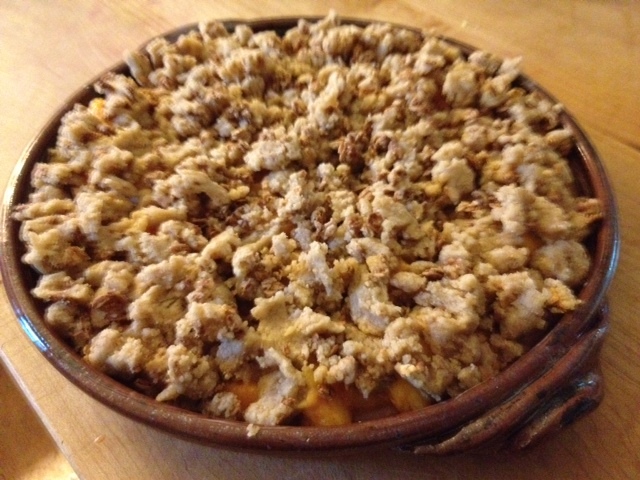 But on to the Peach Crumble Pie! After dinner Mike still felt hungry and we deemed that “room for dessert.” Since we had a few peaches left over (some on hand and then a few more we picked from the trees) we decided to make some type of cobbler, pie, or crisp (so many words for such similar things!). I knew we would not be making a traditional pie crust because the truth is that I simply don’t think that a really good gluten-free vegan pie crust exists. I’ve tried so many mixes, so many recipes, and have experimented so many times on my own, but in the end the most I can say is that at times they have been passable (and most of the time horrendous). That just isn’t good enough for me. I’ll eventually get back to that quest, but in the meantime we had these peaches… We looked at a bunch of recipes online and a bunch of recipes in our cookbooks. In the end we came up with something that is very (VERY) loosely based on everything we read. I’ve gotten pretty good at the art of substitutions and understanding the texture, heaviness, and oiliness of various flours and sugars. I also don’t like things that are super icky sweet so we significantly reduced the amount of sugar that all the recipes called for. We did take note of the overall mass of things and that was very helpful. I also chose to go super simple on the spices (just using nutmeg) so that we didn’t mask the flavor of the peaches themselves. The miracle is that this is the first time we made this, it is a totally new recipe made up by us (Mike helped! ), and we wouldn’t change a thing. It is really, really rare for me to taste a first attempt and not think to myself, “I would add less vegan butter next time, or less sugar, or less…[whatever].” It was perfect right out of the gate. We quickly wrote everything down, while it was still fresh in our minds, so that we could make it exactly the same again, and again, and again. I also think that this recipe would work with apples, strawberries, blueberries, cherries, etc. It was so damned good! I am getting a little bit wordy here (and maybe a little obnoxious) so I’ll stop now and get to the recipe. Preheat your oven to 350 degrees Fahrenheit. Use vegan butter – we always use Organic Earth Balance – and generously butter a pie plate. Nothing fancy you need to do here. Mix all the ingredients in a bowl and set aside until you are ready to assemble your pie. Put everything except the granola in the food processor. Pulse the mixture in a food processor so that little butter chunks are roughly evenly distributed. Be careful not to over process this which will break the vegan butter down and make things oily (and weird…I have no better term than this..things just get weird if you over mix/whip the vegan butter). Add the gluten-free vegan cinnamon raisin granola and pulse a few more times to break it up a little and distribute it through the mixture. Give the filling a final stir or two and then pour it into the buttered pie plate. 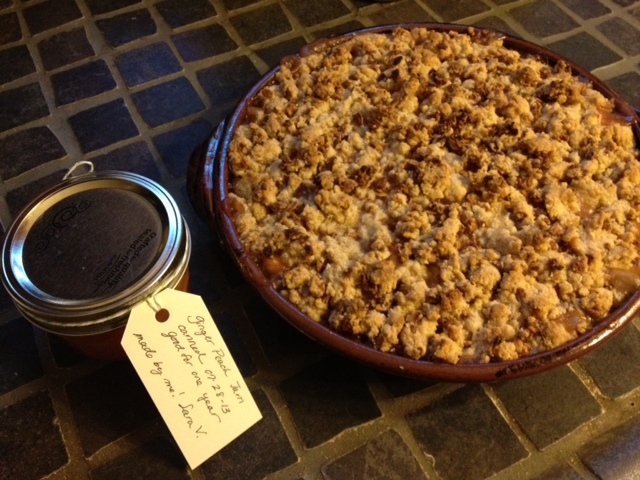 Take the crumble topping and sprinkle it as evenly as possible over the entire top of the pie (no big chunks). Place the pie plate on a cookie sheet – we used our pizza pan – to catch any drips in case the filling bubbles over (ours did). Bake in the preheated over for 45-55 minutes. As with all fruit pies let this one cool a bit before you serve/eat some to avoid burning your mouth. I will make this for us again and try it with different fruits or berries. I know I will also bring this to dinners and pot-lucks too. If you don’t tell them people really will not know they are eating something vegan and gluten-free, and that is the best kind of vegan gluten-free anything. Here are some extra pics from the Peach-A-Palooza. 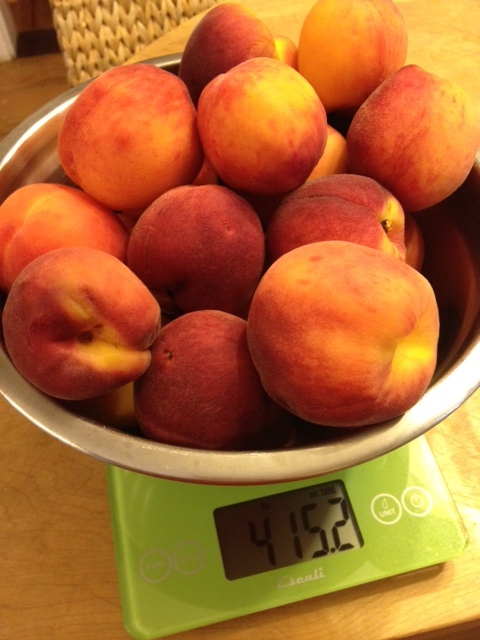 Four pounds of peaches is what you need for the jam. The pie filling before the crumble top-crust is added. A horribly blurry picture of the pie before it goes into the oven. Two of my babies. I’m a proud peach mama.